The 10 SITES COALITION of Downtown Eastside organizations has issued a statement opposing the “Historic Area Height Review,” which goes before City Council on January 20 2011. 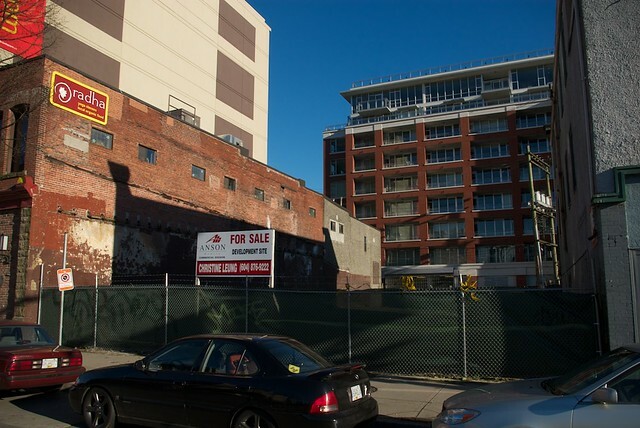 The so-called “Height Review,” which the Coalition calls the “condo tower plan,” anticipates 7 condo 15-storey condominum developments in the Downtown Eastside – 2 North of Pender between Carrall and Abbott, and 5 in South Chinatown. The Coalition statement outlines concerns that market condo gentrification is causing rent increases, renovictions, displacement of low-income residents, increased police harrassments, and erosion of community assets. A three year community-mapping process from 2007-2010, facilitated by the Carnegie Community Action Project, identified “unique and authentic community assets” of the Downtown Eastside community (for the series of three reports, see here). The statement asks Council to instead take proactive measures to stop gentrification by “[buying] 10 sites for low income resident-controlled social housing within the Downtown Eastside before the next municipal election [in Nov 2011]” (click here for a list of the 10 sites). Community groups were also generally supportive of the draft Rezoning Policy, noting however that the Carnegie Community Action Project (CCAP) remains concerned about the impact of new development on the low-income community. Meggs referred the “Historic Area Height Review” incorrectly as the “Chinatown Height Review,” and suggested that the new condo developments were all South of Pender. As mentioned, two of the most controversial sites are North of Pender, including the half-block BC Electric site across from Pigeon Park. Posted in City Hall, Downtown Eastside, Gentrification, Homelessness, Housing, News, Police. Bookmark the permalink. COPE Councillors Ellen Woodsworth and David Cadman voted against this gentrification that will impact low income seniors and low income businesses in Chinatown and in DTES generally.